With this much, often confidential, data being produced – what is being done to protect it? AI is becoming a powerful force in organisations, especially in this digital age, due in part to technology unlocking the potential of big data with AI capabilities.5 If that thought doesn’t give you pause, it should. While AI can be used for good, it’s a tool – and conversely, it can also be used to commit harmful acts. A cybercrime, cyber threat or cyber attack is an illegal activity involving a computer or a network-connected device like an iPad or cell phone.10 The cyber attacker or cyber hacker has the intention of gaining access to a network, stealing confidential data, using the computer as an accessory to a crime, or downloading software to a person’s device without their knowledge. Put simply, this is a practice concerned with the confidentiality and availability of information (such as data), as well as the protection of that information. The level of cyber protection needed depends on whether you’re dealing with an amateur cyber hacker or a dangerous criminal group. The good news is the emergence of using AI to combat cyber attacks could reinforce and improve cyber protection strategies – leading to businesses saving a lot of money. The extent of this cyber threat in the US is compared to an out-of-control epidemic.17 A supervisory special agent with the Federal Bureau of Investigation genuinely believes that all private data on US citizens has already been stolen through cybercrime, and is available for sale on the dark web18 – a notorious part of the internet that isn’t indexed by search engines, that illegally sells items to other criminals, which is only accessible through special software. AI will possibly be the most effective tool for interpreting this data to continually identify present vulnerabilities and to consequently, take action to counterattack and prevent attacks in the future.19 Just two years on and we’re already seeing the use of AI to improve issues like risk management, and to detect anomalies, network cyber attacks, and malicious applications or software. Cybersecurity has emerged as a hot commodity in the tech sector in 2018 thanks to fresh revelations, new regulations and a rise in data breaches. Although the emergence of artificial intelligence in the field of digital protection is predicted by many to become a double-edged sword. 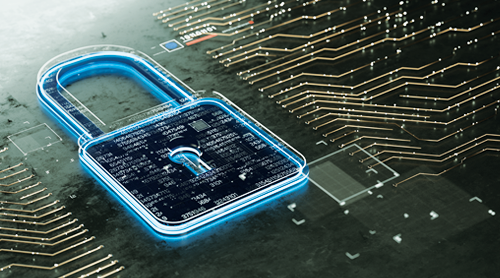 Having a continually-evolving understanding of risk management and current cyber hacking trends, is imperative to distinguish the vulnerabilities of your organisation. 1 Morgan, S. (Dec, 2018). ‘Cybercrime damages $6 trillion by 2021’. Retrieved from Cybersecurity Ventures. 2 Morgan, S. (Dec, 2018). ‘Cybercrime damages $6 trillion by 2021’. Retrieved from Cybersecurity Ventures. 3 (2018). ‘Big Data Executive Survey 2018’. Retrieved from NewVantage Partners. 4 (2018). ‘Big Data Executive Survey 2018’. Retrieved from NewVantage Partners. 5 (2018). 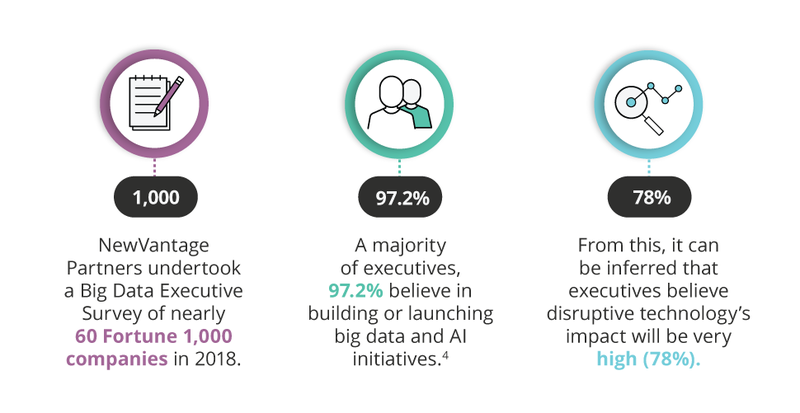 ‘Big Data Executive Survey 2018’. Retrieved from NewVantage Partners. 6 Burt, A. (Jan, 2019) ‘Privacy and cybersecurity are converging. Here’s why that matters for people and for companies’. Retrieved from Harvard Business Review. 7 Morgan, S. (Oct, 2018). 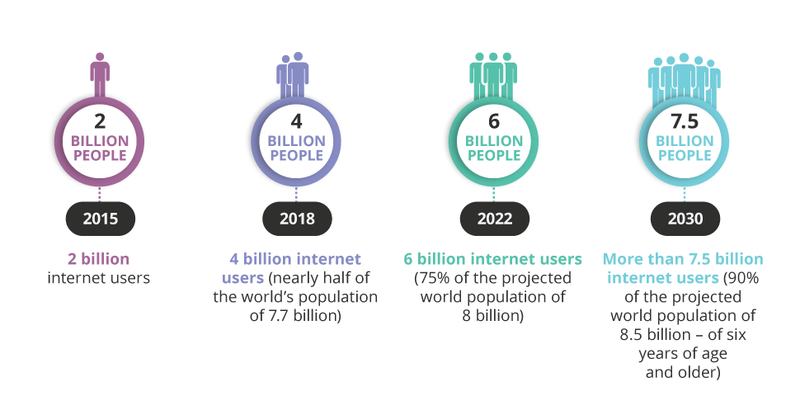 ‘Top 5 Cybersecurity Facts, Figures, Predictions, And Statistics For 2019 To 2021’. Retrieved from Cybersecurity Ventures. 8 Burt, A. (Jan, 2019) ‘Privacy and cybersecurity are converging. Here’s why that matters for people and for companies’. Retrieved from Harvard Business Review. 9 (2019). ‘The 2019 Official Annual Cybercrime Report’. Retrieved from Herjavec Group. 10 (2019). ‘11 ways to help protect yourself against cybercrime’. Retrieved from Norton by Symantec. 11 Yogesh, B. (Dec, 2018). ‘Cybersecurity trends 2018: Year of regulations and breaches’. Retrieved from Cybersecurity Investing News. 12 Morgan, S. (Dec, 2018). ‘Cybercrime damages $6 trillion by 2021’. Retrieved from Cybersecurity Ventures. 13 Morgan, S. (Dec, 2018). ‘Cybercrime damages $6 trillion by 2021’. Retrieved from Cybersecurity Ventures. 14 Norton, S. (Nov, 2017). ‘Era of AI-powered cyberattacks has started’. Retrieved from The Wall Street Journal. 15 Norton, S. (Nov, 2017). ‘Era of AI-powered cyberattacks has started’. Retrieved from The Wall Street Journal. 16 Yogesh, B. (Dec, 2018). ‘Cybersecurity trends 2018: Year of regulations and breaches’. Retrieved from Cybersecurity Investing News. 17 Morgan, S. (Dec, 2018). ‘Cybercrime damages $6 trillion by 2021’. Retrieved from Cybersecurity Ventures. 18 Guccione, D. (Jan, 2019). ‘What is the dark web? How to access it and what you’ll find’. Retrieved from CSO. 19 (February, 2018). ‘AI will underpin cybersecurity’. Retrieved from Cybersecurity Intelligence. 20 (February, 2018). ‘AI will underpin cybersecurity’. Retrieved from Cybersecurity Intelligence. 21 (2019). ‘Products’. Retrieved from SparkCognition. 22 SE Labs. (Mar, 2018). ‘Predictive malware response test’. Retrieved from Cylance. 23 (2019). ‘Mobile Threat Center’. Retrieved from Appthority. 24 (2019). ‘Solutions’. Retrieved from BehavioSec. 25 (2017). ‘2017 Global Information Security Workforce Study’. Retrieved from Centre for Cybersafety and Education (ISC)2. 26 Khoja, R. (Dec, 2017). ‘How AI is the future of cybersecurity’. Retrieved from Info Security Group.